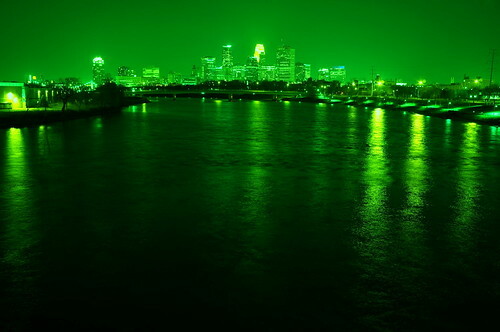 Minneapolis Skyline In Green, on the Mississippi River, Minneapolis, Minnesota, March 2012, photos © 2012 by Liz Schultz. All rights reserved. Happy St. Patrick’s Day. I am not one to go out on the town and tackle a green beer, but I do celebrate my roots by remembering my Irish ancestors. Standing on the porch of their 1876 home in Augusta are my great great grandparents, the Murpheys. It gives me chills to look at that photograph. Miles away from Georgia, it is March 2012. Even though it was pushing 80 degrees yesterday, when the cool evening breeze rolled in, I sat on the couch and watched a movie. Liz zoomed to Roseville to take a photo class on Night Photography, a way to become more familiar with her Sony NEX-5N. When the movie was over, I fell asleep. And she came home with this photograph of the Minneapolis skyline in green. There are no special effects. She perched her tripod on the Broadway bridge, set the camera on manual, and worked with a custom white balance. The camera’s brain honed in on a spot in the middle of the Mississippi and set the whole scene’s white balance by river deep Spring waters. Minneapolis saw green; I saw the luck of the Irish. Night Flower Faces The Sun, Minneapolis, Minnesota, August 2008, photo © 2008 by QuoinMonkey. All rights reserved. ONE: The 8th Stage of the Great Round, Functioning Ego, allows you to stand on your own two feet, reach out, and engage the Universe, much like a flower turns to face the sun. Medium: Crayola markers, Portfolio Brand Water-Soluble Oil Pastels, and Rainbow Magic pens that change & erase color. 5-Pointed Star, Minneapolis, Minnesota, August 2008, photo © 2008 by QuoinMonkey. All rights reserved. TWO: In the rising star of Stage 8, others begin to take notice of skills, abilities, and dedication to your craft. 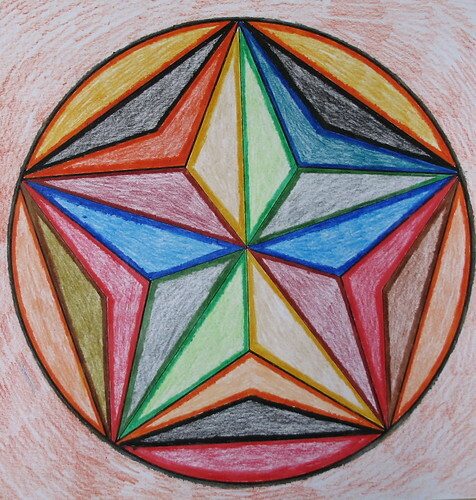 The 5-poined star mandala has a firm foundation, arms outstretched, head held high. Medium: Reeves Water Colour Pencils. Laws Of Nature, Minneapolis, Minnesota, August 2008, photo © 2008 by QuoinMonkey. All rights reserved. 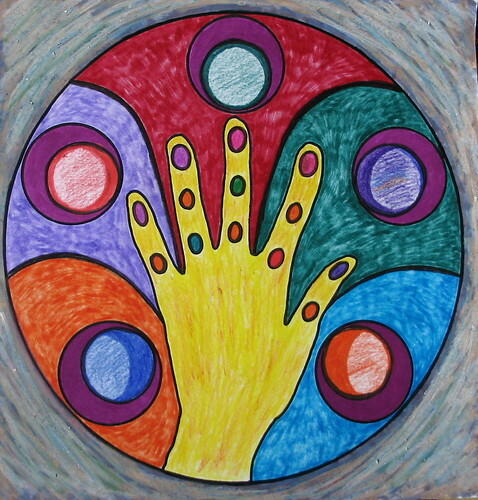 THREE: During Stage 8, you take life by the hand and learn to manage the many circles spinning around you. Whether a complex project, people working together in the spirit of cooperation, or the waxing phases of the Moon, you are learning to work in harmony with Nature. Medium: Crayola markers, Portfolio Brand Water-Soluble Oil Pastels, and Reeves Water Colour Pencils. Thunderbird, Minneapolis, Minnesota, August 2008, photo © 2008 by QuoinMonkey. All rights reserved. 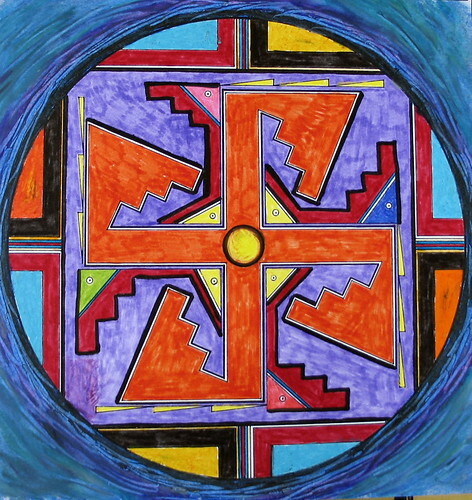 FOUR: In this Native American mandala, the static cross sprouts wings and becomes a spinning Thunderbird form, ancient symbol of the Sun. Archaeological evidence of this shape on ornaments dates from the Neolithic period. Medium: Crayola markers, Portfolio Brand Water-Soluble Oil Pastels, and Reeves Water Colour Pencils. Whether starting your own business, remodeling your home, or managing interpersonal issues as a community leader, Functioning Ego is about taking Action. 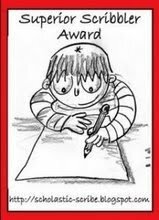 A time of doing, not being, Stage 8 becomes activated when you take the initiative to bring an inspiration into reality, and really kicks in when you are engrossed in the challenging tasks required to reach your goals. I’m currently working on the tail end of October’s mandalas, along with a painting in the studio. The textures and colors are kind of wild on the canvas, so I thought I’d continue to use the mandalas to talk about color. Some time ago, when I was researching information on Providence, I ran into Johann Wolfgang von Goethe’s Theory of Colours (original German title, Zur Farbenlehre). The last major color breakthrough had been in 1660 with Sir Isaac Newton whose work in optics led to his creation of the color wheel. For Newton all the colors existed within white light. But Goethe’s Colour Wheel arose from the interaction of light and dark, and the psychological effects of color. Goethe didn’t see darkness as an absence of light, but polar opposite and interacting with light. Colour resulted from the interaction of light and shadow. Yellow is a light which has been dampened by darkness; Blue is a darkness weakened by the light. Light is the simplest most undivided most homogenous being that we know. Confronting it is the darkness. Goethe wanted to uncover color’s secrets and investigated whether rules could be used to govern the artistic use of color. He created a Colour Wheel but later found his ideas were best expressed within an equilateral triangle. In Goethe’s original triangle, the three primaries red, yellow, and blue, are arranged at the vertices of the triangle. He chose the primaries based as much on their emotional content as on their physical characteristics. To Goethe it was important to understand human reaction to color, and his research marks the beginning of modern color psychology. 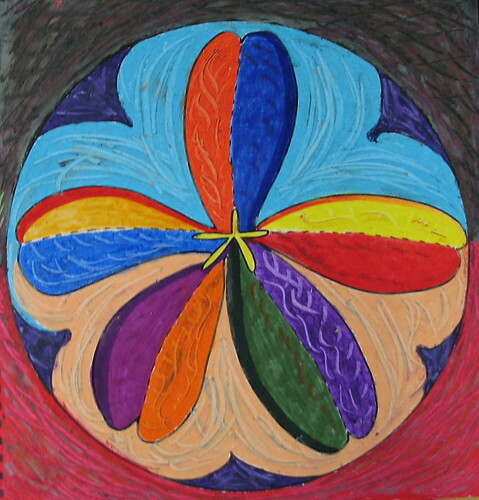 He believed that his triangle was a diagram of the human mind and linked each color with certain emotions. Blue evoked a quiet mood, while red was festive and imaginative. The emotional aspect of the arrangement of the triangle reflects Goethe’s belief that the emotional content of each color be taken into account by artists. Goethe’s theories of color and emotional response, once considered radical, are commonplace in today’s world. Over the course of the year, I am learning about my own color preferences in relationship to the circle. 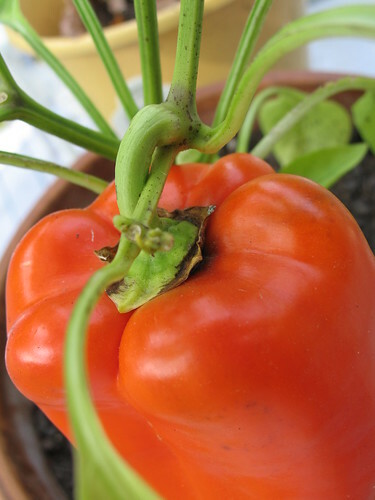 Perhaps color observations about our work say as much about us emotionally, as they do our art.